There were some very scary moments that could have been catastrophic for grape growers in Niagara, but, despite all that, another blessed milestone was achieved this week in the evolution of Grape X. An extremely hot early spring, followed by at least two nail-biting below zero nights in late April, has kept wine growers on pins and needles, and, in some cases, on speed dial to the local helicopter company, to deal with the threat of frost. 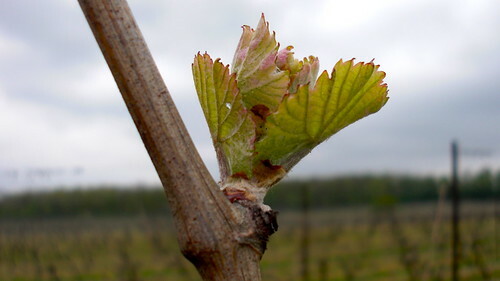 But sure enough, it happened just this week, nature followed its path and bud break occurred at wineries across Niagara. We set out to follow one single grape from one single vine being grown in the famed St. Urban Riesling Vineyard at Vineland Estate, that’s presided over by winemaker Brian Schmidt and respected viticulturist Roman Prydatkewycz. It is here that we have chosen a vine that will yield, in time, our Grape X. For this second part of our adventure, something we call the Grape Chronicles, we will follow the evolution of Grape X from bud to bottle. The vine we have chosen to follow for this project is in the first row of Field D, the 10th post (from Vineland’s restaurant) and the second vine from the post. It is marked with a pink ribbon. This is Grape X as it was on April 17. This is Grape X as of May 8. A lot has happened since I last posted on April 17 when warm temperatures put bud development ahead by two or three weeks. 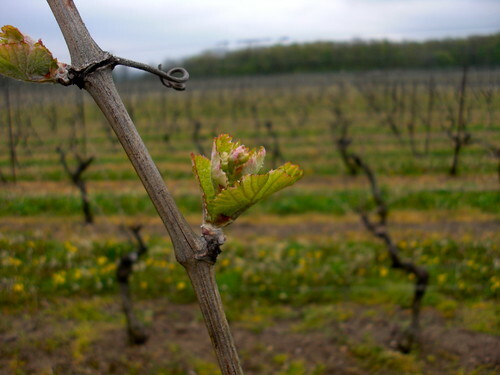 Bud break seemed imminent and it looked like Niagara was setting up for an early harvest. Then all hell broke loose. The wrath of Mother Nature came down hard on southern Ontario, sending temperatures plummeting in late April and threatening to do major damage. For two nights, wineries without wind machines employed helicopters to maintain temperatures on the ground, doing what they could to keep things a degree or two warmer. A bird's-eye view of Vineland Estate from a helicopter. 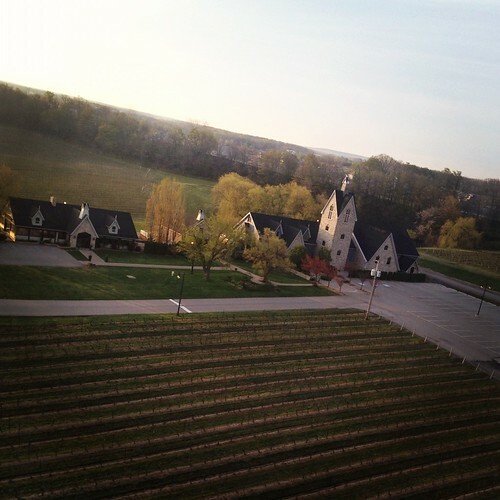 The helicopter flies over Vineland's neighbour, Tawse Estate winery. 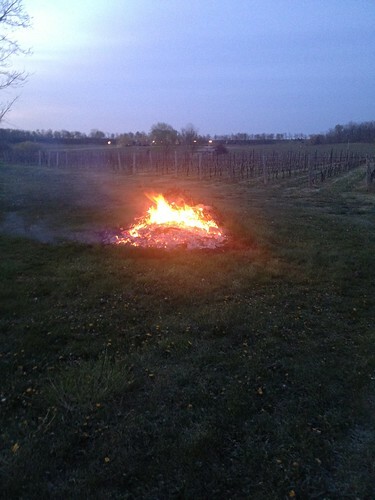 Vineland doing everything it can to heat up the vineyards during the frost risk. The frost caused substantial damage to apple, cherry, plum and nectarine orchards, with some predicting the lowest yield loss up to 70% in some areas of Niagara. But grapes were spared the worst of it and only minimal damage was reported in most appellations of Niagara. Maybe it was the love shown to grape growers that spared them the worst. It was comforting to Schmidt and others to see the support on social media for Niagara growers. With bud break now in the books and the next milestone in the evolution of Grape X being flowering, I asked Brian Schmidt about the spring so far and the wild ride he’s been on since early April. Our vine is now has two of its shoots tied off with two others left for insurance purposes. There are 14 buds on the tied off shoots and 16 buds on the insurance shoots. The Grape X vine in the St. Urban vineyard as it was on May 8. 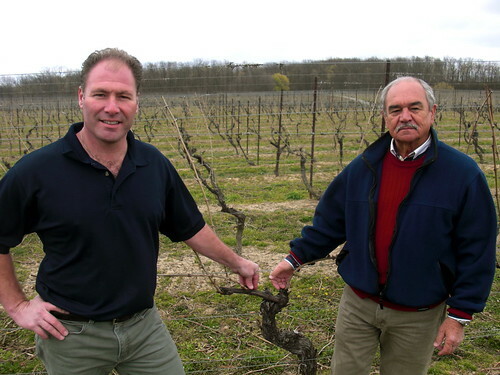 Wines in Niagara: How does such a promising beginning to a season turn so wrong so quickly? One minute it’s warm and gorgeous and the next you guys are in helicopters battling frost. How nerve-wracking is that and was there any lasting bud damage. Brian Schmidt: Promising yes, but we always knew there was a risk associated with the blessing of an early spring. 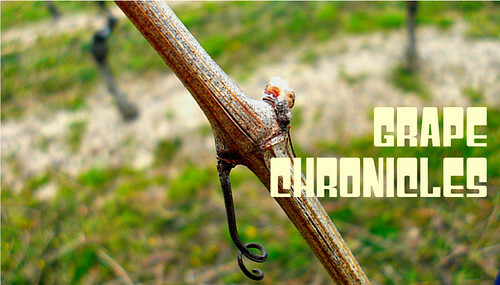 Wine regions across the globe are dealing with changing and inconsistent weather patterns. We are no different. Our task is to make small adjustments to compensate for Mother Nature’s curve balls and to not let ourselves get discouraged. Of course, this can be nerve-wracking. But this is what we’ve signed up for. There are worse places we could be other than in Wine Country worrying about the wrath of Mother Nature. Too hot. Too cold. Too dry. Too wet. Farmers will always find something to worry about. So far we do not see any excessive bud damage. However I have seen (in other years) shoots emerge and begin to grow as usual then suddenly collapse, seemingly without reason. I pray this does not happen this year. WIN: Are you out of the woods yet? BS: We are never really out of the woods until the grapes are harvested. However, I am reasonably certain we no longer have the risk of more cool mornings causing frost damage on the buds. Having said that, those extra canes you see that have not been tied down, I won’t cut those off for another few weeks. They are our insurance policy. WIN: Are you still ahead of normal for vine development? BS: We are still ahead of a “typical” (season) by about 10 days or so. This can change at any point in the season. Ten days of cool temps (days that do not collect heat units) could easily reset that clock. WIN: What are the most susceptible varieties for frost? 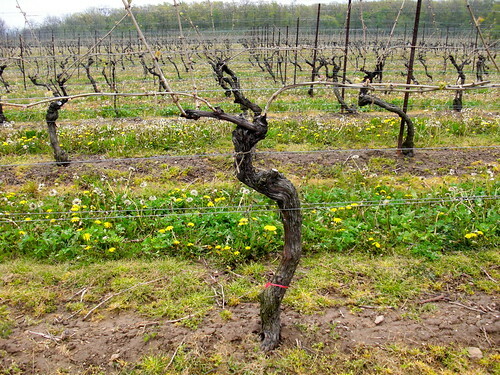 Soil type and the age of vines also play a large role in when vines begin to “push” or “swell.” As the soil warms, the root system wakes up and begins to deliver nutrients in the form of sap to the vine. The buds begin to swell and eventually emerge as small leaves. 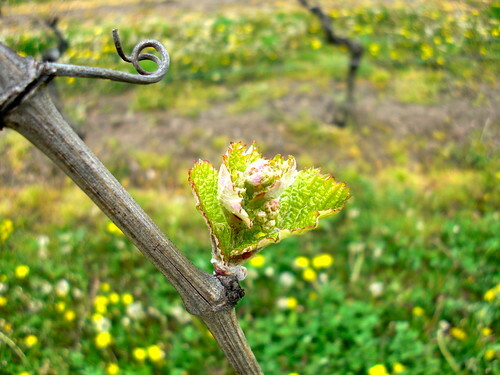 This is when the vine becomes sensitive to spring frosts. WIN: How many nights were in the danger zone for you guys? BS: Two mornings were particularly dangerous. April 28-29. We recorded temps as low as -2.6C with some Niagara vineyards seeing -3. 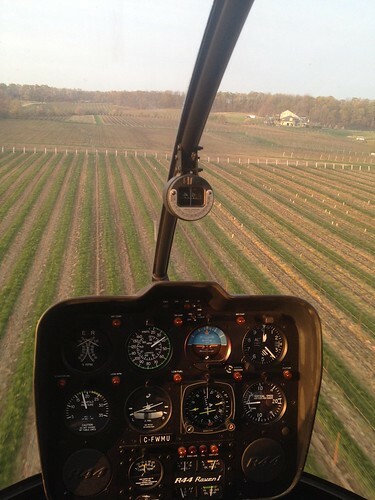 During one morning we contracted a helicopter to fly above the vines with the idea that any warm air that may have risen as the cold air settled on the ground could be pushed back down. Even a small difference (0.5 degree) in temperature could make difference. WIN: Why do some of you have wind machines while others don’t? BS: Location, location, location is the best answer. Vineyards on the Escarpment have natural wind-machines available to them. The Escarpment provides a natural waterfall effect for cool air. As the cool air rushes to the lowest point, a small amount of wind is created, this coupled with the convection effect that the warm air provided by Lake Ontario creates offers a small degree of protection. Any large relatively flat pieces of land on the Escarpment or those areas with “low” spots could benefit from windmills. Those vineyards relatively close to the edge of the Escarpment may enjoy some natural protection. Niagara-on-the-Lake, which has relatively little “relief” or change in elevation, has found wind machines to be very helpful in mitigating any damage. WIN: There seemed to be a real community spirit in Vineland during the frost nights. Does everyone work together in situations like that? BS: Yeah, for sure. None of us want to see our neighbors suffer. 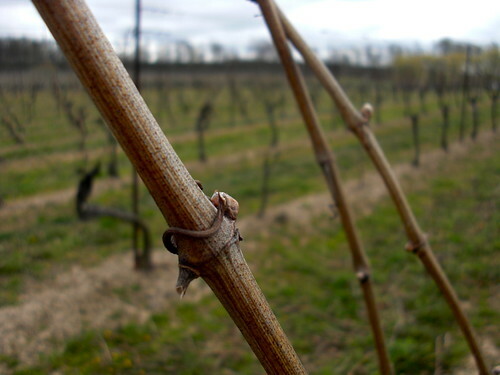 Our Bo-Teek Vineyard shares a border with Tawse, Ridgepoint and Megalomaniac, The Thiessen and Nedelco families are close by. If one of us is being affected by something usually all of us are. Helping each other is not unusual, we regularly borrow equipment, help get each other’s wine delivered to restaurants, taste each other’s wines, and share in each other’s successes and failures. Our neighbors are not our competition. Italy, Spain, Australia, etc. (although they, too, have great wines) would be our competition. WIN: It was kind of neat to watch all the well wishes pour in on twitter during the frost nights. Social media adds a whole new dimension for you guys, no? BS: I love Twitter! Social media allows us all to (almost) instantly connect to a large number of people with a shared interest. Twitter was once explained to me as a LARGE dinner party where we get to wander in and out of conversations on topics that are compelling and might interest us. During the frosty evenings I would tweet pictures throughout the early morning. In 140 characters or less I would try to explain what was happening. This allowed people that were interested or concerned to be involved. The kind and concerned comments that followers sent to me were in turn very encouraging. Giving me a direct connection to those that care about Ontario Wine, letting us know our efforts are appreciated. Twitter is very powerful (I wonder if Toronto Maple Leaf followers can tweet our way to a Stanley Cup anytime soon). WIN: Tender fruit trees were hurt badly by the frost. Why didn’t the grape vines suffer as much? BS: Tender fruit trees suffered more damage because they were further along in their development (ie: buds swelling). As well, most fruit trees are grown on flat parcels of land where the cold air ultimately settles (it can’t go anywhere else) and it is not common practice for tender fruit farmers to use wind machines (not sure why). WIN: What are we looking for next? Flowering? And how long does that take from bud break? BS: We are once again at the mercy of dear old Mother Nature. Flowering (bloom) will occur next. We will need a few more weeks of warm weather to get close. We will be disking the rows, turning the soil and grasses. This will allow the sun’s warmth to penetrate the soil and give the soil a chance to breathe. We will also see the vines shooting (suckers) unwanted growth from the base of the vine. We will travel up and down the rows removing these by hand ensuring all the vines’ energy is used to produce great wines. “There are so many talented winemakers in Ontario. Each of us is responsible for working with vineyards and growers to produce wines that suit their intended purpose. Given the opportunity to make wine from the St. Urban Vineyard I am certain many of these talented winemakers would have a similar result. Vineland Estate St. Urban Vineyard Riesling 2009 ($20, 92 points) — This is classic Niagara Riesling from the famed and historic St. Urban Vineyard. A nose of zesty, mineral rich citrus goodness that carries to the palate in a pure expression of sweet-tart citrus, minerals and racy acidity. I would lay this down in the cellar for a few years and watch as it develops those wonderful mineral qualities. And this version, from the highly acidified 2009 vintage, will cellar very well indeed.